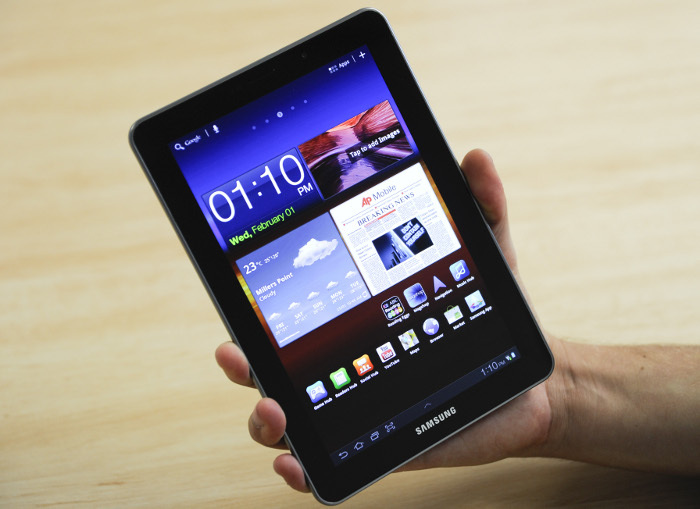 Samsung deserves plenty of credit for the design of the Galaxy Tab 7.7, one of the thinnest and lightest tablets on the market. However, the Galaxy Tab 7.7 is ultimately hindered by Google's Android 3.2 "Honeycomb" operating system, which makes the user experience less than stellar. If you are hellbent on owning a 7in tablet, we'd give the Galaxy Tab 7.7 another look once it gets upgraded to the latest Ice Cream Sandwich verion of Android. Another day, another Android tablet. This time it's the Samsung Galaxy Tab 7.7, a compact and lightweight tablet with a 7.7in screen. The Galaxy Tab 7.7 has a fantastic design that is both superbly constructed and super thin, but it is unfortunately let down by outdated Android software that dampens the overall user experience. It seems Samsung is intent on releasing a tablet with every screen size imaginable. It has already produced 10.1in, 8.9in and 7in sized tablets, along with the 5.3in, part smartphone, part tablet Galaxy Note. The Galaxy Tab 7.7 adds a fifth screen size to the mix, attempting to strike a balance between portability and functionality. Although 7.7in may initially seem like an odd screen size, the ultra slim and light form factor of the Galaxy Tab 7.7 makes it feel logical. The tablet is just 7.9mm thick and weighs only 335g, making it one of the thinnest and lightest devices in its class. As a comparison to other smaller tablets on the market, the Galaxy Tab 7.7 is both thinner and lighter than the BlackBerry PlayBook, the Acer Iconia A100, and the Toshiba Tablet AT1S0. 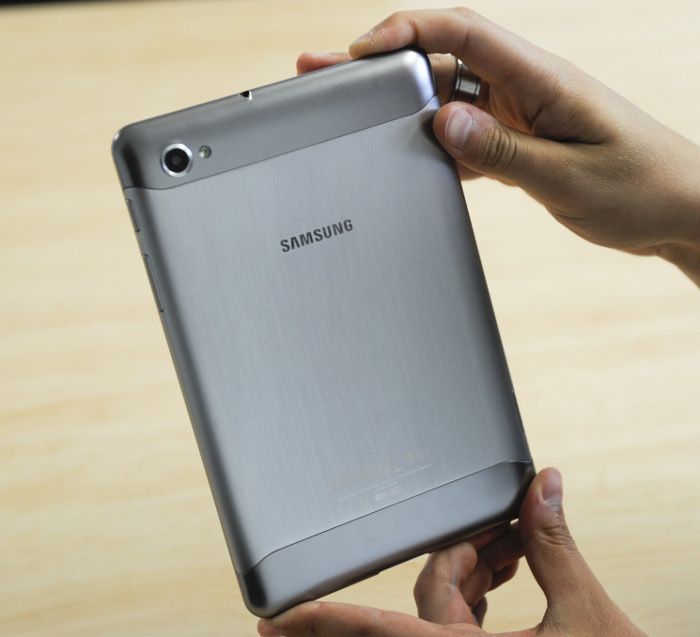 The Samsung Galaxy Tab 7.7 is instantly recognisable thanks to an attractive brushed metal finish on the back and a thin, silver bezel around the edges. Every aspect of the Galaxy Tab 7.7's design screams quality — from the well positioned power and volume keys that provide great tactility, to the gloss silver edging surrounding the headphone jack. The Galaxy Tab 7.7's svelte frame has made it tough for Samsung to include extra ports, but the tablet covers most of the basics. On the top edge you'll find a headphone jack, on the right side volume buttons and a power/screen lock key and on the left a microSD card slot, covered by a plastic flap. The bottom of the device houses dual speakers and Samsung's proprietary dock connection. This connector looks remarkably similar to Apple's 30-pin connector port used on both the iPhone and iPad. The Galaxy Tab 7.7's design is complemented by an outstanding screen, an AMOLED Plus panel with an impressive resolution of 1280x800. The display is responsive, has excellent brightness and impressive colour reproduction. The 1280x800 resolution may not sound all that special on paper, but when you consider this is the same number of pixels used in most 10in Android tablets, the result is a sharper and crisper image. This is especially evident when reading long blocks of text on a Web site.